FN is a Belgium company established in 1899 to make arms and ammunition and from 1901 to 1967 was also a motorcycle manufacturer. FN manufactured the world’s first four cylinder motorcycle and became famous for the use of shaft drive in all models from 1903 to 1923. 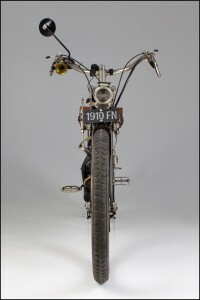 In 1905 the first 362cc shaft drive in-line FN inlet-over-exhaust four cylinder motorcycle appeared. This was the world’s first manufactured four cylinder motorcycle. These pioneer machines had a five bearing crankshaft with pedal assist.